Call is high “see-see-see.” Song is high series of “tsee” notes accelerating into a trill. Description: Tiny and plump. Grayish-olive above; whitish underparts; two white wing bars; small, slender bill; slightly notched tail; striped crown; and broad white eyebrow. 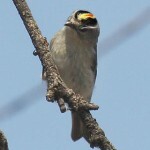 Male has orange crown patch that is bordered in yellow and black; female’s crown is yellow with black borders. Habitat: Found in a wide variety of woodlands, forests, and scrubby habitats. Tends to prefer conifer stands. Where in Nebraska: Common to uncommon spring and fall migrant, and an uncommon winter resident across the state. Perhaps more common in eastern Nebraska. 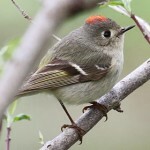 Field Notes: Often seen in mixed flocks outside the breeding season consisting of Ruby-crowned Kinglets, creepers, nuthatches, and chickadees. 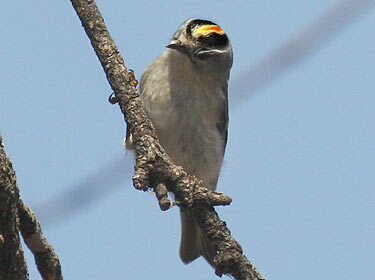 Fun Facts: The Golden-crowned Kinglet makes its nest so small that it must lay its eggs in more than one layer.